Technological breakthroughs, commercial innovation, and consumer preferences continually influence how food moves through the supply chain to its place on U.S. dinner tables. Although it’s hard to predict exactly how food markets will evolve, stakeholders have learned an important lesson by watching consumers reshape American dining solutions: U.S. families appreciate food shortcuts that save time. The advent of refrigeration and improved food storage capabilities changed kitchen output dramatically, enabling home cooks to prepare food in advance and run their residential kitchens more efficiently. As food science advanced, researchers developed preservatives to further extend the shelf life of food and perishable ingredients. The longstanding tradition of cooking from scratch was all but abandoned by many home cooks, as busy families embraced the convenience of processed foods and shelf-stable goods. As consumer values evolve, a modern food renaissance is again reinventing Americans’ approach to dining. Among young eaters, shifting values currently trend toward healthy eating and sustainable food sourcing. Some of the processed products that helped past generations cope with family food responsibilities are unacceptable to young home cooks. At the same time, modern lifestyles demand the same ease and convenience that make processed foods attractive. The latest wave of culinary convenience, meal kits have caught on with socially conscious young American shoppers, because the packaged recipe kits bridge the gap between simple preparation and healthy, high-quality fare. As producers jockey for position in the expanding market segment, various methods have emerged for getting meal kits into the hands of consumers. A growing number of food companies now deliver meal kits directly to consumer doorsteps. And more and more retail locations offer meal kits for in-store pick-up. Will home meal delivery services from companies like Blue Apron, Plated, Freshly, and others prevail, or does in-store pick-up represent the future of the meal kit industry? Food research highlights noted differences between each generation’s approach to dining. Overall, recent generations are more inclined to eat out than their parents and grandparents are. As a result, millennials and young people spend less on food at home than past generations did. Convenience is very important to this group of young consumers, so members of the demographic purchase more prepared, and ready-to-eat foods than older shoppers do. Meal delivery kits fill a niche enabling young home cooks to embrace cooking from scratch, without devoting precious time to menu-planning, tedious grocery shopping, and recipe trial and error. Food habits help define family dynamics in the US, and vice versa. That means effective food innovation must account for hectic modern lifestyles. Home food delivery represents the ultimate shopping convenience, so the once unheard-of meal kit category has exploded into a mainstream method for putting food on the table. Yet the industry has already undergone significant transformations during the relatively short time meal delivery kits have been available. As the niche matures, the original meal kit sales model, built on direct home delivery, may itself be losing favor to in-person kit pick-up. Blue Apron and other meal kit trailblazers are riding the front of the curve, so these companies provide case studies for the industry. Among other lessons gleaned from the industry’s growth and development, meal kit companies and their packaging partners are quickly learning online sales alone may not be enough to sustain profits. Meal kit delivery companies like Blue Apron have arrived at a crossroads. Bringing-on new subscribers for home meal kit delivery is now only part of the recipe for future success. To compete, meal providers must also find new ways to connect with buyers. 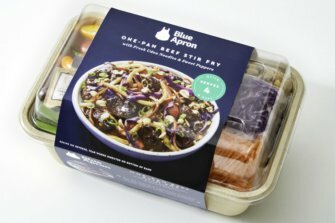 Eagerly embraced by consumers hungry for a new approach to food preparation, Blue Apron is now learning lessons from the niche the company itself created. Amid growing competition and distribution challenges, Blue Apron currently serves 24% fewer customers than it did one year ago. And, though the company recently grew its subscriber base by 5%, compared to the prior quarter, the gain may not provide a lasting sales boost. Meal kit users are known for leaving their delivery subscriptions after only a few months. It may be the case that placing orders online and taking home delivery isn’t the best way to get meal kits into the hands of consumers. According to some experts, the writing is already on the wall; an in-store presence is an essential ingredient for meal kit success. In order to gain a competitive advantage, online meal kit providers have been forced to discount their products and offer generous incentives to lure new customers. While the approach has helped Blue Apron and others get consumers’ attention, the price is too steep for a sustainable business model. Instead, it is thought companies need to offer wider variety and flexible in-store pickup options. In addition to lack of variety, consumers cite cumbersome product packaging and high delivery costs as obstacles to home delivery. Pick-up generates less waste than delivery, because packaging companies are able to reduce the amount of material used when meal kits are distributed through retailers. In-person pick-up also eliminates shipping charges. Stocking meal kits in stores responds to consumers’ call for greater variety. Instead of ordering a week ahead and selecting recipes for delivery, meal kit users can spontaneously select dishes at stocked retail locations. As Blue Apron experiments with a meal kit program at Costco stores, grocery retailers have begun rolling out their own branded kits. In addition to Kroger and Albertson’s taking steps to provide meal kits in their stores, retail giants Walmart and Amazon have also shared plans to launch supermarket meal kit sales at their brick and mortar locations. While meal kit companies continue expanding distribution options, the crowded, competitive sector poses new sales and marketing challenges. To broaden their consumer appeal, online sellers are already responding with expanded kit options designed for groups and meal kits that include appetizers and dessert. At the retail level, sellers are focused on healthy kits. With Weight Watchers poised to enter the grocery store meal kit market, it is thought healthy themes will continue selling well for other kit makers too. Traditional meal kit companies face a distinct disadvantage distributing through retail stores. 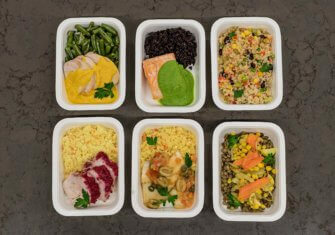 Meal kit makers package their recipe kits remotely, before transporting the meals to store shelves. But grocers build their kits in house, so they can quickly replenish their stock as units sell through. This crucial efficiency advantage may be all grocery stores need to effectively compete with outside meal kit vendors. In order to compete in an increasingly crowded retail segment, meal kit makers need to find ways to stand out among the competition. Innovative packaging design plays a key role in the evolving meal kit industry, helping producers put a proprietary stamp on their kits. As in-store pick-up continues challenging home delivery as consumers’ meal kit preference, product packaging companies are paving the way with marketing and merchandising solutions for the evolving industry. Convenient home delivery services have catapulted meal kits into the mainstream. However, the original delivery paradigm is losing favor to pick-up alternatives. As meal kit companies scramble for in-person, retail sales, time will tell whether home delivery rebounds or retail distribution takes over the meal kit industry. What are the Benefits of Working with a United States Packaging Company? How Are Seasonal Gift Sets Packaged?